A few weeks ago, we invited friends over for dinner. We hadn’t seen them in quite some time and looked forward to catching up. They happen to be vegetarians, so I made a big spread of fancy meatless goodies: Roasted sweet potato rounds topped with goat cheese, fig jam and spicy pecans; a crustless spinach and feta quiche; balsamic mushroom tart; and a giant arugula salad with fennel and grapefruit. Let me tell you, I think it was my favorite meal that we ate all month long. And I gloried in the leftovers for a few days. That dinner reminded me how much I really enjoy eating lower-meat menus, and how satisfying it can be to get creative with fruits and vegetables. Besides, grocery prices seem to be constantly rising, and the kids are only going to keep growing and eating more (help!). With meat coming in as the most expensive category on the list every week, J. and I have constantly talked about trying to bring our two growing carnivores around to a few more meatless meals. But — and I’m sure this is relatable to many of you — when it comes time to plan meals and cook things, I always seem to fall back on the tried and true favorites, because it’s easier for me and I know everyone will be happy and pleasant at the dinner table. Still, the boys are old enough now to understand why we might make some different choices, and getting to the point where they’re mostly adventurous enough to try — and even maybe like — some new things. So I’m starting off slowly, with the aim of getting most of our months to about half meatless meals by summertime. It’ll be a hard sell in some ways, since two of the four of us despise most legumes, but I’m cooking them anyway and have been adding beans and lentils in small amounts to some of our meals to keep working on acceptance. We’re probably never going to be a totally meatless family, especially since L. particularly seems to thrive better with some meat in his diet, but focusing more on plant-based dinners is too good for our health, our budget and the planet to ignore. 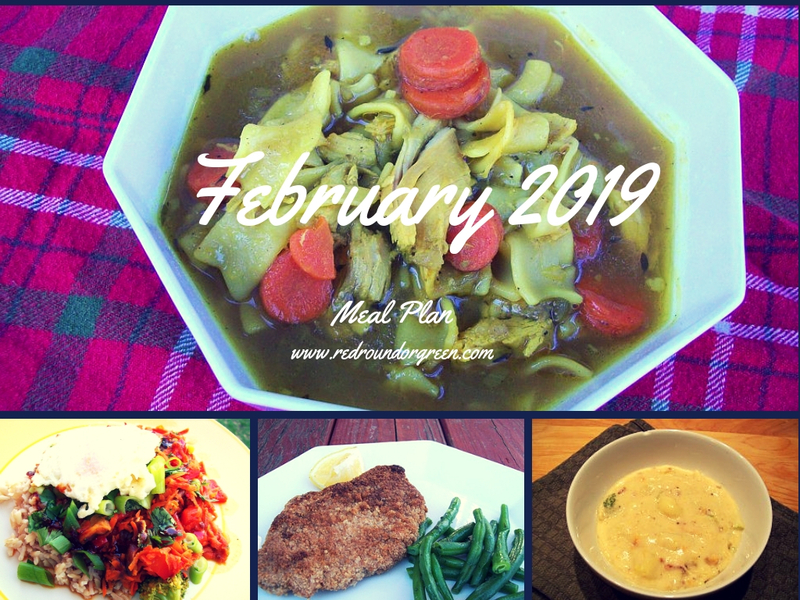 With all that in mind, the February meal plan isn’t too radical, but it does consciously include a few little forays — dipping my toe into the water, so to speak — into serving low- or no-meat meals. (We’re allowing eggs as we try to encourage more vegetarian eating. I know some people wouldn’t, but we’re not those people.) By my count, we’ll be eating less meat-focused meals about a third of the time this month, which is a good start to being a little more mindful and will hopefully present the boys with some reasonably well-liked dinners that don’t include a big piece of meat. Saturday, 2/2: Out to dinner after a late fencing tournament for P.
Saturday, 2/9: We have plans with friends, and haven’t figured out yet what dinner will look like.